How can I tell if an email is visible to everyone or just me? You can see which emails are visible to your colleagues and which ones are only visible to you by looking at the information tabs. You can see which emails are visible to your colleagues and which ones are only visible to you in a couple of ways. 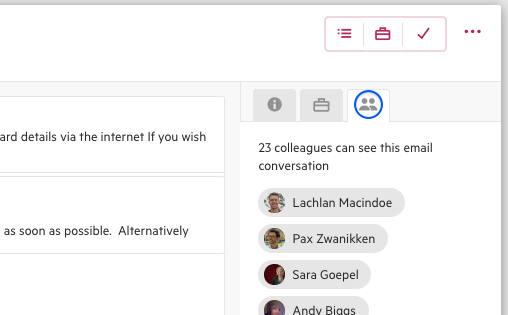 The email's colleague's tab will list everyone in your team who is able to see the email. The colleagues listed have access to the email because they are involved in the email conversation, email comments, or the email appears on a work or contact timeline that they have access to. Any contact or work timelines that the email appears on are indicated on the information tray.